Are you a teacher blogger? Or do your students blog? I’m guessing one of your biggest obstacles to doing as much on your blog as you would like is time. When we’ve surveyed our Edublogs community about their biggest obstacle to blogging, the results were clear. Time is a barrier for everyone! 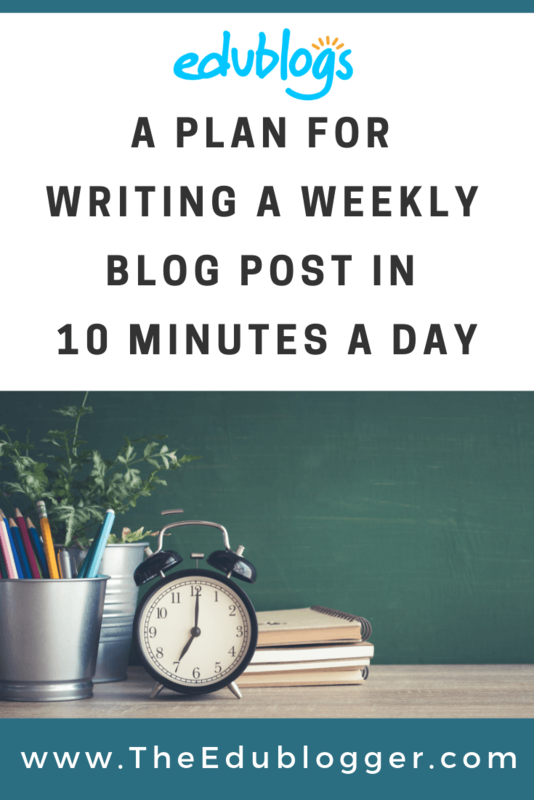 This post outlines a simple approach that will see you develop consistency with your blogging and publish one blog post a week. 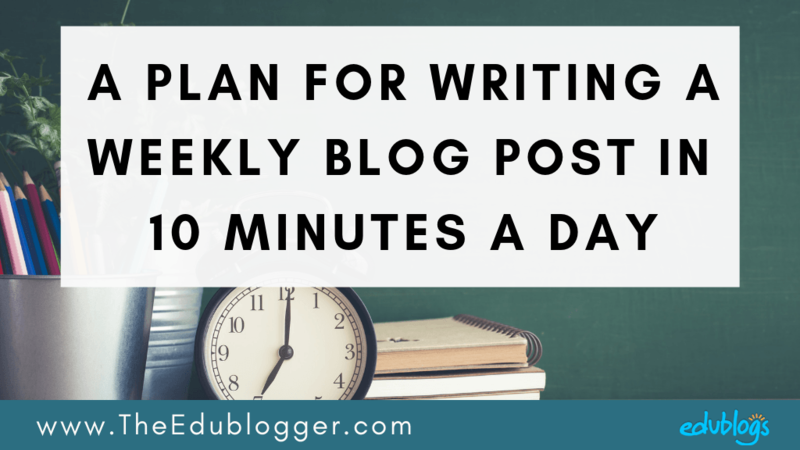 Whether you’re a teacher or a student, you can use this plan to reach your blogging goals, without sitting at your computer for hours on end. Sound good? Let’s take a look! Before we dive into our weekly outline, consider using the time you’re not at your computer to do something productive and ponder blogging ideas. Blog in your head? Really? You might think you can only blog when you’re sitting at a device but in fact, you can blog anywhere/anytime. Many regular bloggers note that even when they’re not at their computer, they’re thinking of ideas for posts or even coming up with phrases or layouts. Personally, I do this all the time! To reach your blogging goals, try to make a conscious effort to put some thought into your blog during your downtime: driving, standing in line at the store, folding laundry and so on. Using your “white space” well can nourish your creativity and imagination! In the classroom setting, I’ve often enjoyed taking my class for a 10 minute walk around the school grounds to give them time to think. Maybe it would work for your students and help them with idea generation. We know how easy it is for thoughts to come and go so make sure you have a strategy for getting those great ideas jotted down. This might be on a Google Doc/Sheet, in a notebook, or in a Note on your phone. Tip: Most professional bloggers have some sort of editorial calendar. Often this is just a calendar in Google Sheets where you plan out your blog titles and dates. This could really help you stay organized and prioritize your blog. Here’s our 5 day blogging plan that will see you get a blog post written every week using small blocks of time; ideally 10 minute blocks! Obviously, feel free to adjust the actual days to what suits you best, or even spread this process out over two weeks if this publishing schedule suits you. Hopefully, on Monday you will already have an idea for a blog post. It might something that’s been brewing in your head or you might grab it off your running list of ideas/editorial calendar. Today is all about creating an outline. You should be able to get this done in 10 minutes. 1) The first step is opening up a new blog post. Write a working title. Don’t worry too much about it as you might think of a better idea later. 2) Next, you’ll use headings to outline your post. Start with Heading 2 as Heading 1 is your title. If you put sub-headings under Heading 2, they’ll be Heading 3. Any sub-headings under that will be Heading 4. You don’t want to skip levels. 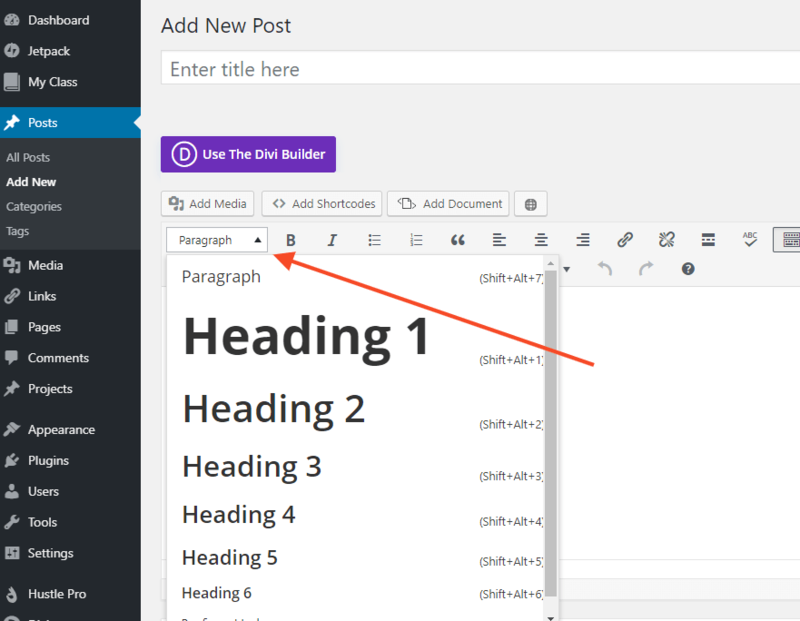 To make headings in your classic editor, just highlight your text and look for the ‘Paragraph’ option in the toolbar. Clicking on it will bring up a menu of the 6 heading tags and you click on the one you’re after. Use a number of headings as they break up your text. Often, readers will only scan your page and just look at your headings. So, make them informative. For example, in the heading above I wrote “Monday: Outline Your Post With Headings”. If I just wrote “Monday” skim readers wouldn’t understand what they need to do on that day. Professional bloggers rarely use colored headings but some students and teachers like to. If you do choose to use color make sure it’s a dark color that people can read (i.e. avoid yellow/aqua/light green or you’ll leave your readers squinting to make sense of the text). 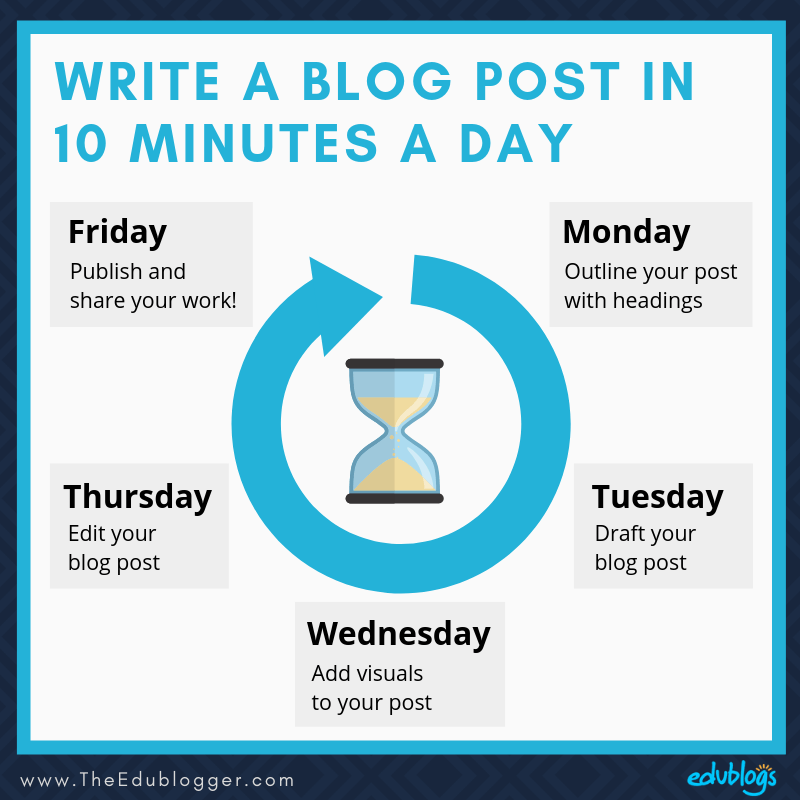 Today is the day where you’re going to set your timer for 10 minutes and write as much as you can of your post. Of course, if your typing isn’t overly speedy or you haven’t got your thoughts together, you might need a little more time. However, spending a short block of time on intensive writing can really help you be productive. Just write! Don’t worry about fixing up your spelling or grammar. You can come back to that. If you can’t think of the perfect word or phrase to use, just write something and come back to it later. You don’t want to do any editing today because giving yourself space to do this with fresh eyes can work wonders! Remember I mentioned that most readers will just skim your post? Along with headings, your readers’ eyes will be naturally drawn to images. Images can help make your blog posts easier to read and understand. Most images you find on a Google or Pinterest search are protected by copyright and cannot be used without permission (even if you attribute them). We have a post all about copyright, Creative Commons, and fair use if you’d like to learn more. Check out my comparison of sites where you can find images that don’t require attribution. You can embed all sorts of media in your blog posts such as comics, quizzes, polls, videos, social media, and more. Canva is a fantastic place to make images. You might like to read our guide on using Canva. For a quick graph, a handy choice is a free tool call Beam. We have a help guide about embedding media if you need more information about this. Alternatively, check out our help guide for adding an image to a blog post. Now, you could spend a lot longer than 10 minutes on this task. It can be easy to go a little crazy! Limit yourself to finding one or two great images for your post or making something yourself — e.g. a graph or comparison chart. Now the bulk of your post is done, it’s time to come back with fresh eyes to edit. Look at your title. Does it describe your post well? Is it clear? Does it make your visitors want to read your blog post? Fix up any spelling or grammar mistakes. Need help with proofreading? Try a free tool like Grammarly. Note: Grammarly is 18+ but users aged between 13-17 can use it with permission. Rephrase anything that doesn’t work. If some of your phrases or word choices in your draft weren’t the best, now is the time to fix them up. Use a thesaurus to improve your word choice if necessary. Power Thesaurus is a free crowdsourced online tool. Check for readability. Is your post easy to read even if readers are skimming or on a mobile device? Would more paragraph breaks, bullets, or images enhance your post? Add and check your links. Including links is an important part of blogging. Your links could either be to other relevant posts on your blog or other websites. Add your links now and ensure those links are working. Preview in your browser. Rather than reading through your post in your editor, it can be helpful to press ‘preview’ and look at your post in a new tab. You’ll be able to see what the published post will look like and it might be easier to spot errors. What else do you need to add to your blog post? Add categories and tags. All blog posts need to be in a category and tags can help organize your content. Read more about using categories and tags in this help guide. Does your blog post theme have a custom excerpt or a feature image? If so, remember to add this information before you’re done. SMO and SEO tips for more advanced bloggers: Remember to fill in the details of your Search Engine Optimization Simple SEO Plugin and Social Media Optimization WP SMO Plugin if you’re using them. Friday: Publish And Share Your Work! Yay! You’ve done all the hard work. Now it’s time to publish your post and share it with the world. Before you do hit publish, it never hurts to preview your blog post and have a final quick read. When you finally press the publish button, your work is not done. Just because it’s online, doesn’t mean it will be seen. Could you share the post on social media? Could you comment on another related blog post and leave the URL to your own post in a thoughtful comment? Could you email your new post to anyone (especially if you’ve linked to them in your post)? Could you pin your post to Pinterest? 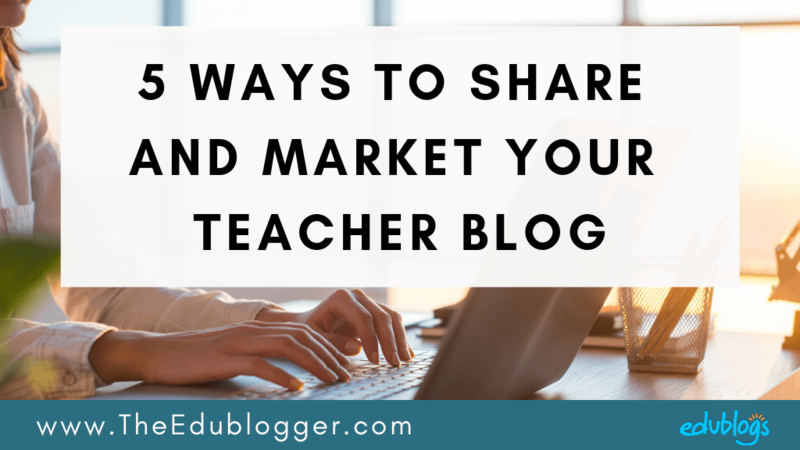 5 Ways To Share And Market Your Teacher Blog is a recent post with lots more ideas for what you can do after hitting that publish button. We said visuals can enhance your blog posts, right? Here’s a summary of what we discussed. Feel free to share this with fellow bloggers. Our 5 day plan can be carried out in under one hour a week if you are strict with yourself. This can be a more productive approach than sitting down in one block of time and trying to get your post started, finished, and published. Spacing out your post and letting it “marinate” can be an excellent way to ensure your content is top notch! Finally, remember to figure out what works for you. We’re all different and while it’s interesting to hear about approaches, stay faithful to what you know fits in your schedule and helps you produce the best results. We’d love you to share your own approach to writing a blog post in a comment. Any tips for others? Or perhaps you have challenges that you need advice on? Let us know. Scroll down to find the comment box. Thanks for this excellent post. You are always very encouraging! As you know, I’ve been keen to start blogging for a little while now, and while timing is one of the reasons I’m a bit slow to get started, the other reason is that I worry that there are too many blogs out there and I really don’t have anything new to add! What is your take on that perspective? This is a great question and I think it’s something many people ponder. I definitely think there is only one ‘you’ and there is a group of people who would love to hear what you have to say. Your unique voice and experiences will set you apart. Think about topics that you like following via blogs, social media, podcasts etc. Are you always on the hunt for new people in the fields you’re interested in that you can follow? I know I am! Also, you might consider if there is a particular ‘niche’ that you can focus on with your blog. I know when I first started blogging, I’d write about anything to do with teaching. That’s fine but I’ve found over time that there are certain niches I tend to write about now — things like digital citizenship, global collaboration, blogging etc. I find that a lot of people who follow my blog are particularly interested in one or more of these areas. The more specific you are, the easier it might be to build a community. Let’s know if I can help more! Kathleen, you really know how to help us save time! The next Student Blogging Challenge will begin in October. While you’re waiting, you’re welcome to work through our Blogging Bootcamp for students that will help you get started with blogging!